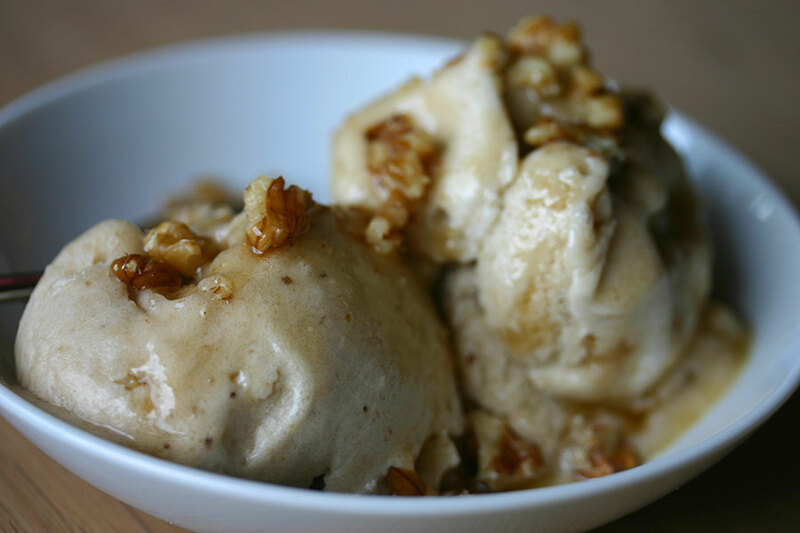 Frozen banana “ice cream” is a little bit of culinary magic – just sixty seconds in a food processor to transform frozen slices of banana into a smooth, silky dessert. I first discovered it in David Cohlmeyer’s The Vegetarian Chef in my student days, and have been happily whipping up batches of the stuff ever since. I’ve experimented with adding cocoa powder, vanilla, ginger, cardamom, but usually stick to the basic mixture then top it with maple syrup, chopped nuts or a splash of rum. The ice cream can be eaten straight away or packed into a container and frozen until needed. Peel the bananas, slice them into 1 cm thick pieces and freeze until solid. In a food processor, purée the banana, lemon juice and salt until smooth. Serve topped with walnuts, a drizzle of maple syrup (and a splash of rum for the grown-ups). I have some frozen mango I think I will try this method with. Love the easiness. Let me know how you get on – I’ve never tried it with anything other than bananas. I think maybe the starchiness or high pectin content of bananas are responsible for the resulting texture, but curious to see how mangos turn out!